Shirleyann and I were honored to be invited to present “Hove” as part of the Martyr’s Day Commemoration at St. John’s Armenian Church in Detroit. Father Garabed was an incredible host, kind, eloquent and welcoming. As we drove onto the grounds of this beautiful church, we were struck by the powerful image of 1500 white crosses planted on the lawn. 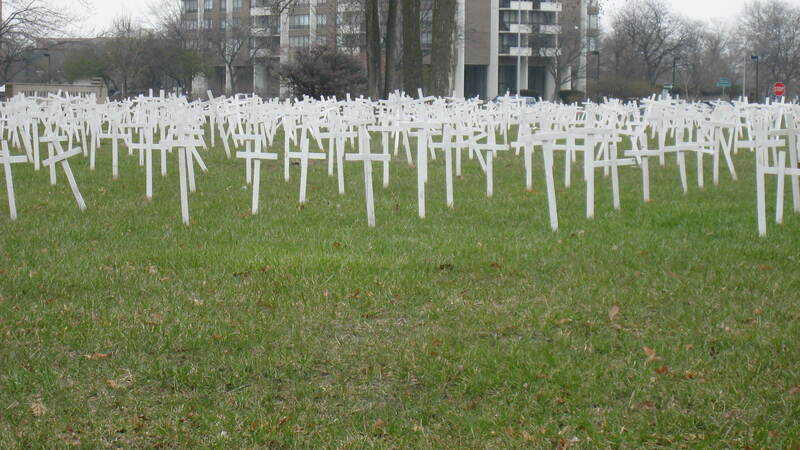 Each one representing 1000 of the 1,500,000 Armenians slaughtered in the 1915 genocide in Ottoman Turkey. There was a beautiful requiem service in the sanctuary and an amazing short sermon by Father Garabed. He spoke of the importance of viewing the aftermath of the Genocide as a victory, a victory of survival. He addressed the danger of the Armenian community thinking of themselves as ‘victims’, rather than as victors. As the parent to an Armenian child it really made me pause. I was reminded of the importance and force of the words we use and how powerfully they can define our behavior and self-esteem. A traditional Madagh dinner was served and we then screened the film in the Cultural Hall to a packed audience. This was the first time that HOVE was screened as part of a Martyr’s Day commemoration. I was truly moved and really felt speechless to know that there were actual survivors in attendance. On a personal note, I was thrilled that the evening was so well attended and had gone so beautifully as this is Shirleyann’s hometown and there were lots of old friends for her to see after the event. Thank you so much to Father Garabed and the congregation of St. John’s for such a moving and wonderful evening.